We have just heard a lovely story from one of our patrons, and we want to share it with the community. Quoted from her email to us, with her permission to post. 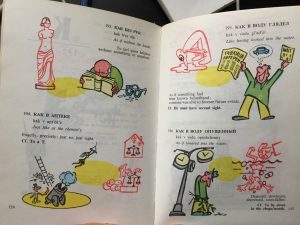 “When I was a little girl, maybe 8 or 9, my mom gave me a Book of Russian Idioms Illustrated, wrote by a Soviet author and published in the USSR in 1980. I used to love this book, I read and re-read it. Idioms are fun by themselves, but this book also had funny pictures and English translations. It fascinated me. Several years ago my mom found this book at their house and gave it back to me. I put it on the shelf. Today I fished it out for [her child] who is struggling with Russian idioms, and discovered that the book has an ex libris stamp: LIBRARY/MEDIA CENTER ANGLO-AMERICAN SCHOOL MOSCOW, U.S.S.R.
How unbelievable is that? What was the journey of this book? Apparently, after it was published, it was imported to the USA by “Imported Publications” in Chicago Illinois (there is a stamp). AAS must have purchased the book from the USA and imported back into Russia for its library, and discarded it a few years later. This book story shows us that there are so many ways for books to be enjoyed and utilized by the members of our community! Thank you for the sharing and for the delightful book journey. We hope to have many opportunities to see stories like this in the future.